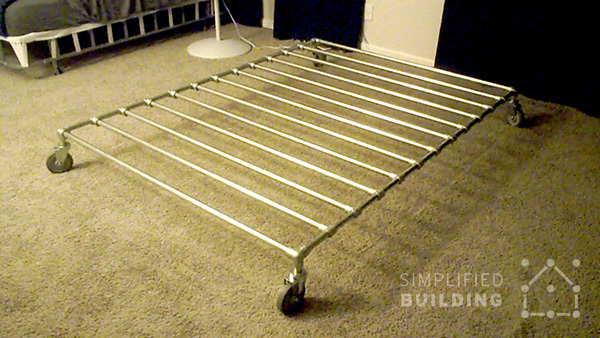 "How to Build a Bed Frame: The Easy Way"
"I think my bed is gorgeous! Your site, from inspirational project ideas, to easy ordering and GREAT advice, made it very easy for me to go forward with my bed frame project. Indispensable guidance and some hand-holding by Acton and Josh was greatly appreciated!" 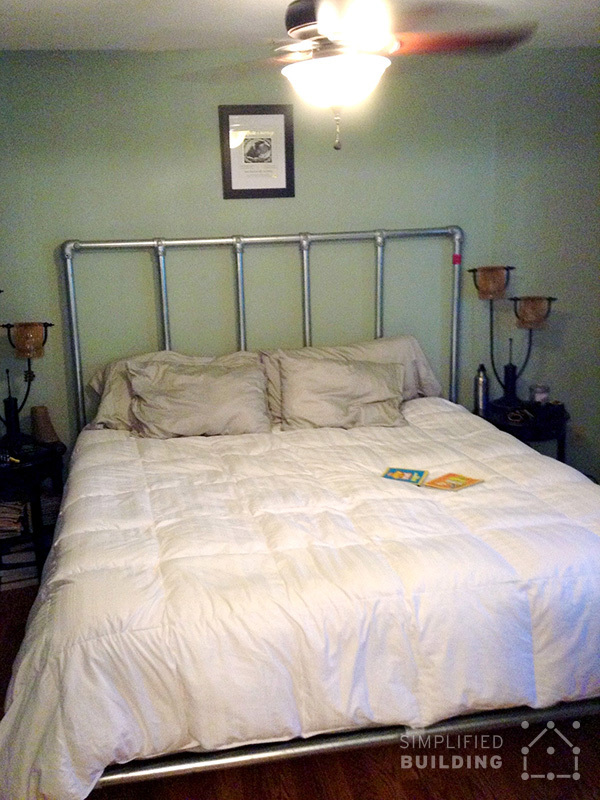 This bed frame was built by Anthony, and his grilfirend, in Cape Coral, Florida. Anthony's girlfriend wanted an outdoor bed for her lanai (porch), so the two drew some inspiration from some designs on the Simplified Building blog. 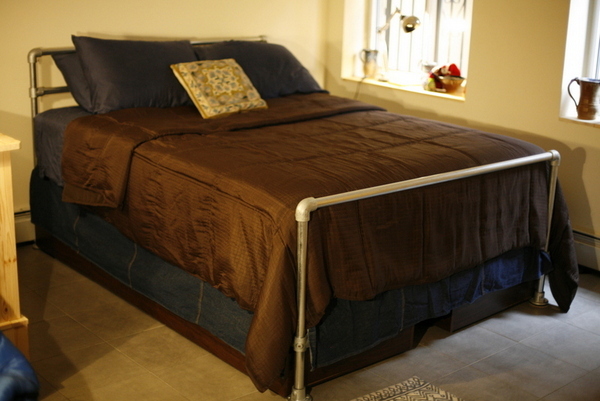 The result is the fantastic bed frame above built with Kee Klamp fittings and pipe. The bed frame features a hand finished rustic ash wood headboard and comfortably seats a full size mattress. One of the best features, the bed is high enough to offer a view of the water while relaxing. 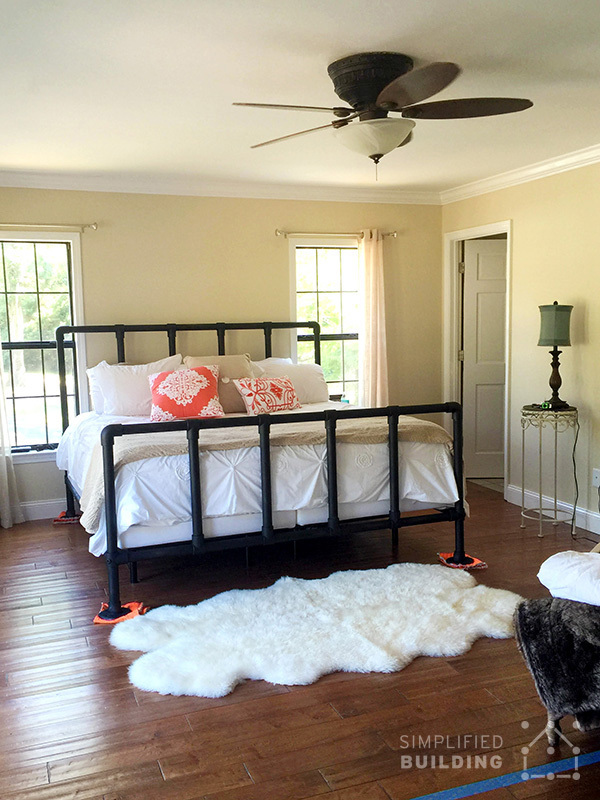 The above bed frame was built by Stephanie from Crandall, Georgia. The frame seats a king size mattress. Stephanie appreciated the ease of use and quality of using Kee Klamp for building the bed frame. "I wanted to make a cool bed that was easy to build, very strong, only needed simple hand tools to build and didn't cost a fortune. I added an over bed table using reclaimed wood and standard black pipe and fittings for a fun feature. The door for the headboard was $25.00 at the salvage shop and the reclaimed wood for the table was free from the scrap yard. I ended up with a really nice fully custom bed for a fraction of the coast of something from a brand store." 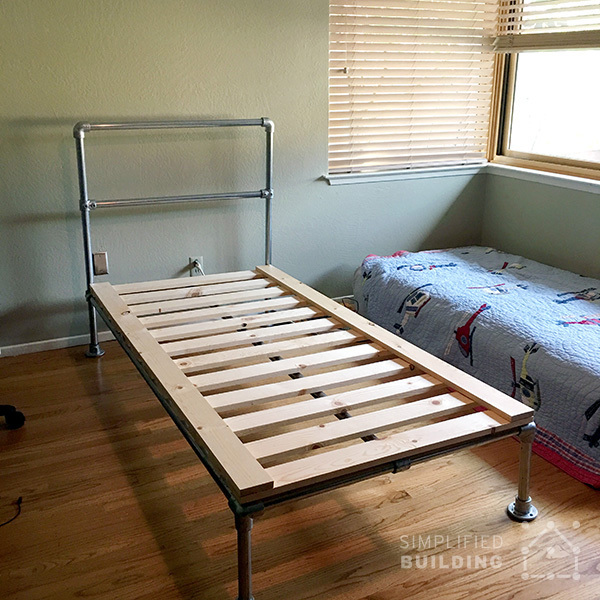 Mitchell from Flagstaff, Arizona built this simplistic bed frame. It's a popular design featured on our blog and we even did a complete write-up on how to build one just like it. Check it out in the following article: "How to Build a Bed Frame". 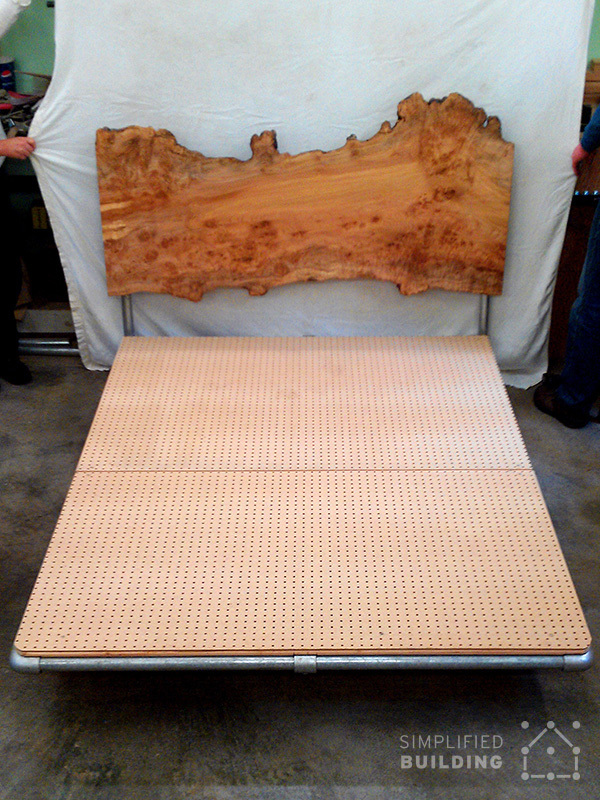 This queen size bed frame was built by Scott and Becky from Salt Lake City, Utah. The frame is approximately 82" long, 60" wide, 30" tall (at the "headboard" and "footboard"), and 18" tall from the floor to the bottom of the frame (where the mattress sits). "We love the bed frame and it was really easy to put together" said Scott and Becky. 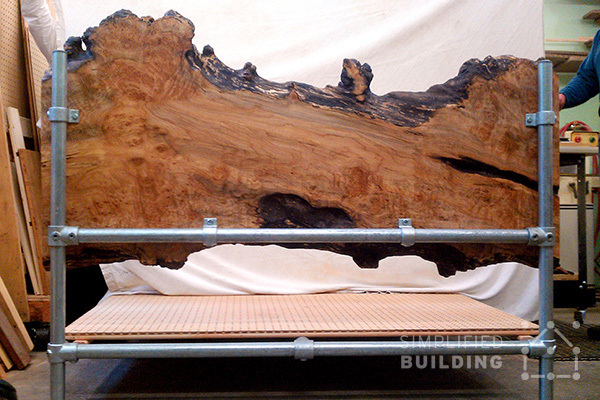 Built by George from Bainbridge Island, Washington, this bed frame features a 2" thick live edge maple headboard. The headboard is attached to the frame using the Fixing Pad fitting. 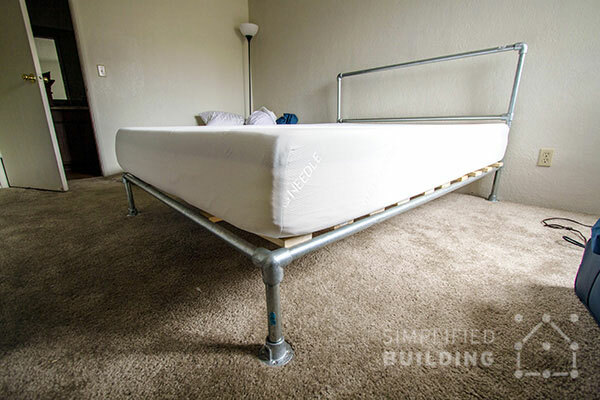 To support the memory foam mattress, George used pegboard placed over the bed frame. Finally, George positioned the legs, at the the "footboard" end of the bed, further back to keep from stubbing toes. A very well though out design. This frame was built by Salvatore from Magnolia, New Jersey for his newly renovated bedroom. Salvatore came up with the idea after browsing through similar ideas on Pinterest. He appreciated the ease of use and cost effectiveness of using Kee Klamp for the frame. After going nearly a full year without a proper bed frame, Aart decided to build one. The result is this simple design that uses Kee Klamp fittings and black pipe to create the frame. Wood slats are then placed over the frame to support the mattress. Aart appreciated the simplicity and ease of use when using Kee Klamp for the project. "I looked at your example bed frame, and tweaked it a bit! I used 1 1/4" piping. It worked great and looks even better! From my wife, 'wow, it's very formidable!' We're happy! Keep up the good work with ideas!" The above frame was built by Sarah from Dallas, Texas. The frame comfortably fits a twin size mattress. 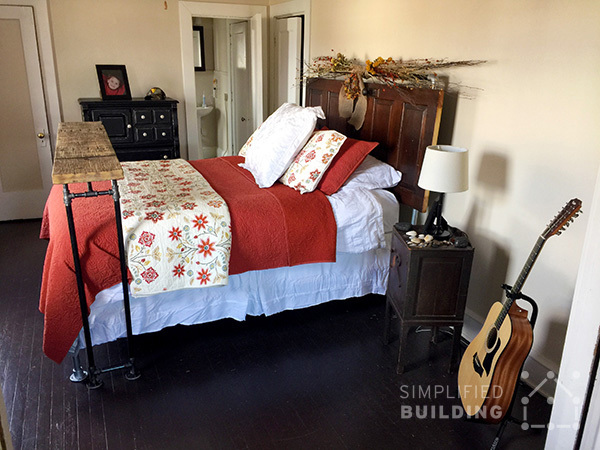 The above platform bed was built by Bill in Edmond, Oklahoma. The frame seats a twin size mattress for Bill's grand daughter. Bill liked the simplicity of Kee Klamp but mostly appreciated the time spent building the frame with his grand daughter. 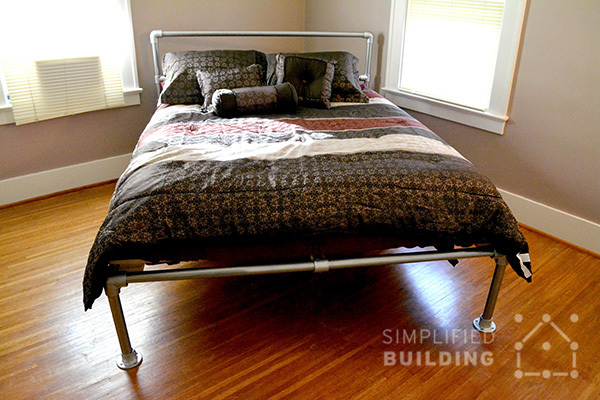 This small bed frame was built by Holli in Sacramento, California. Her son wanted an industrial style bed so Holli took to Google to find some options. 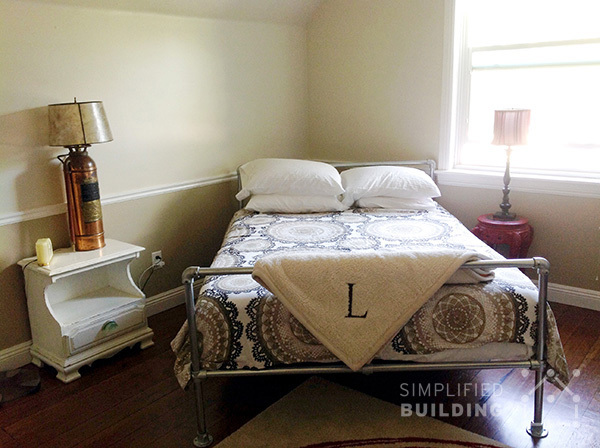 That's when she stumbled across Simplified Building and this bed frame built by a past customer. The rest is history. The bed looks great and easily fits a twin size mattress. 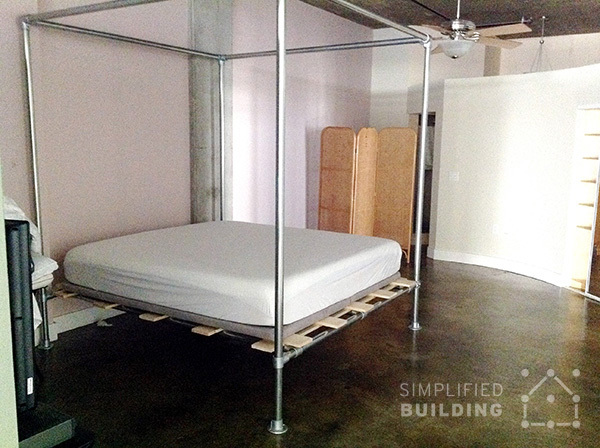 This low profile bed frame was built by Jason in Mountain View, California. The bed frame features integrated casters making the bed easy to move when needed. Jason really appreciates the sturdiness of the frame. He even went so far as to create a video on YouTube testing out the strength of the bed frame. Check out the video here. 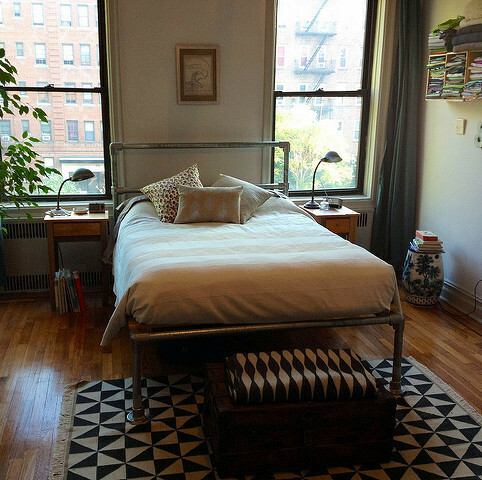 This simple bed frame was put together by Heather from New York City. 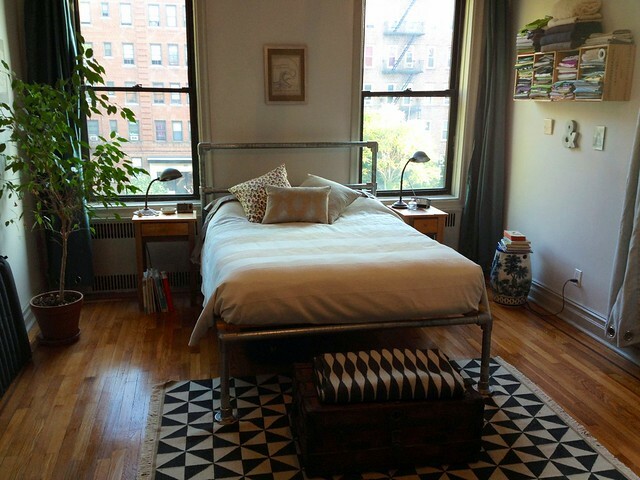 The industrial fittings and pipe pair well with the wood flooring in Heather's chic apartment. 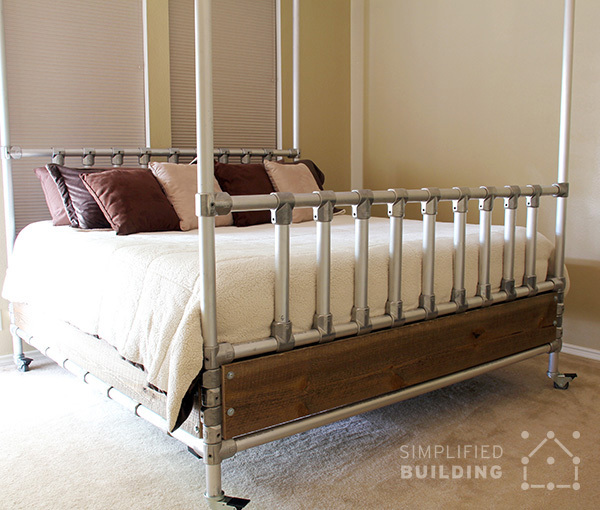 If you want to build a frame like Heather's, we now have bed frame kit to make the process even easier. 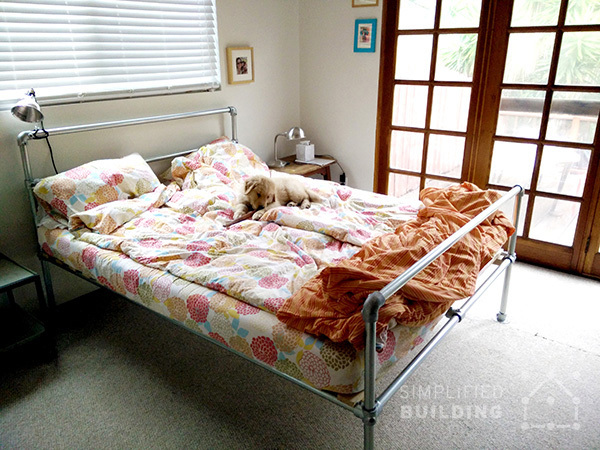 This bed frame was built by Instructable user, Jtwanderlust. The frame makes use of the Kee Lite Crossover fitting to create the intersecting sections at the "headboard" and "footboard" area of the frame. 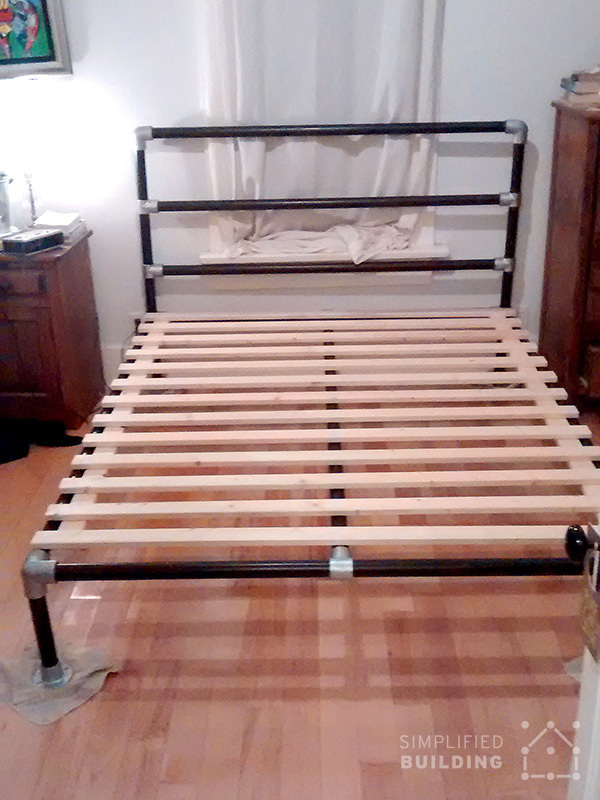 Find step-by-step instructions for this bed frame in this Instructable write-up. This bed frame features a simple design yet makes use of "headboard" section to hang extra blankets and towels. The pipe has more of an aged look that creates an industrial rustic look in the bedroom. Like the bed frame in the previous example, this frame features a simple design that incorporates a very tall "headboard" section. The floor lamps and other elements in the room pair well to create a minimalistic look. 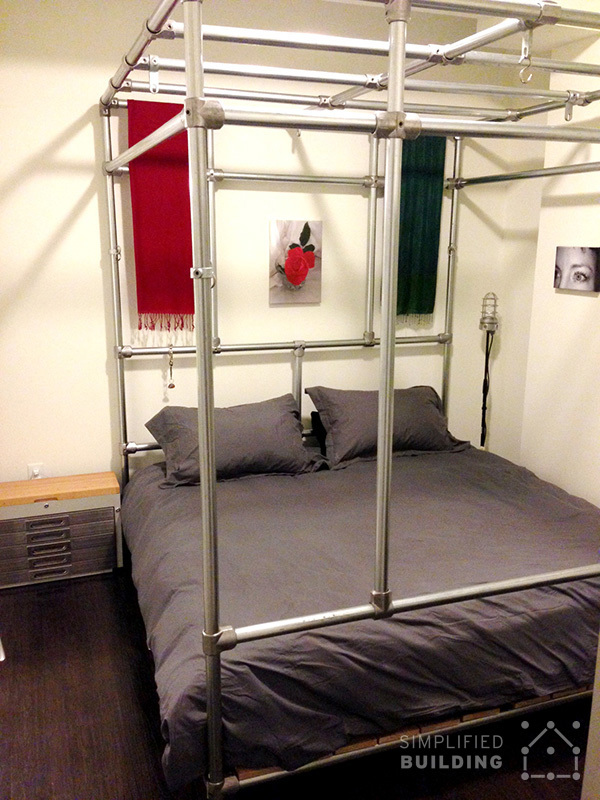 The above bed frame was built by Gabe for his small apartment. In addition to the bed, Gabe also built a standing desk and coffee table with Kee Klamp fittings and pipe. Check out his retrofitted apartment in the following article: "Industrial Apartment Upgrade - Pipe Desk, Coffee Table and Bed". 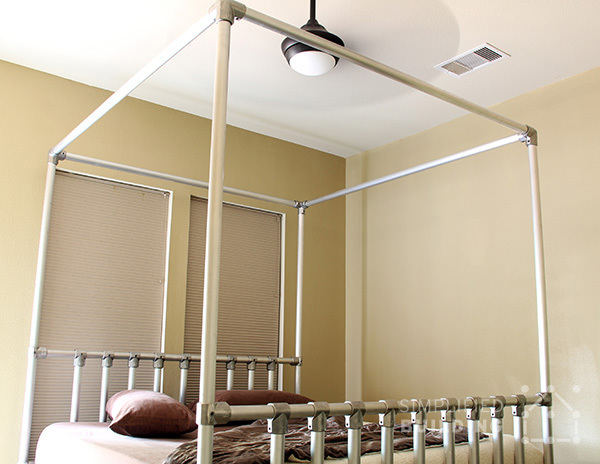 This canopy bed frame was built by Enrique in San Antonio, Texas. 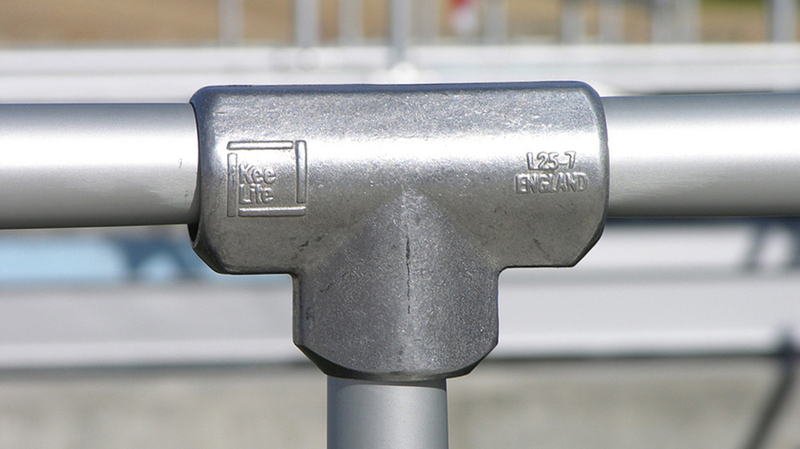 The unique design features integrated Kee Lite fittings and aluminum pipe to make the frame a bit lighter as compared to using Kee Klamp fittings and galvanized steel pipe. It also features integrated casters for easy moving. Finally, reclaimed wood boards are integrated into the bottom of the frame. 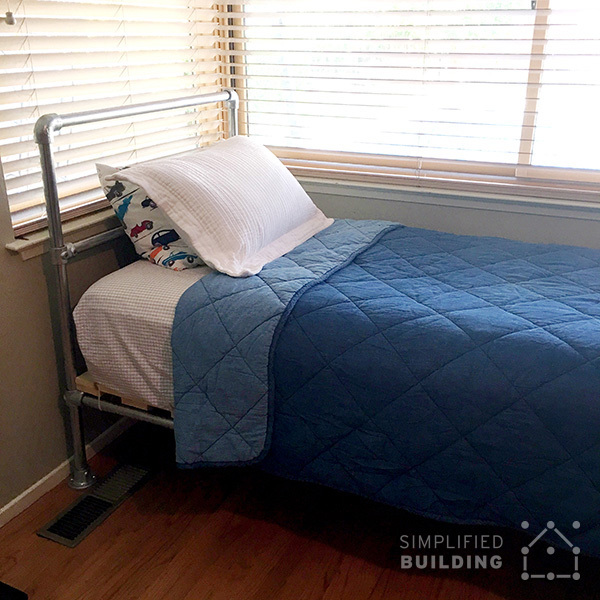 Inspired by a few of the bed frames on our blog, Robert decided to build this queen size canopy bed frame as an alternative to more expensive options he found online. The frame is 60" wide, 81" long, and 80" tall. Robert used 1 1/2" black iron pipe combined with Size 8 Kee Klamp fittings. The pipe was painted a dark steel color and the slats (for the mattress support) are made from 1x4 maples boards that were then stained in an ebony finish. "I think it turned out very well" Robert stated of the bed frame. The above canopy bed was built by Josh for his new home in Denver, Colorado. The frame fits a king size mattress. 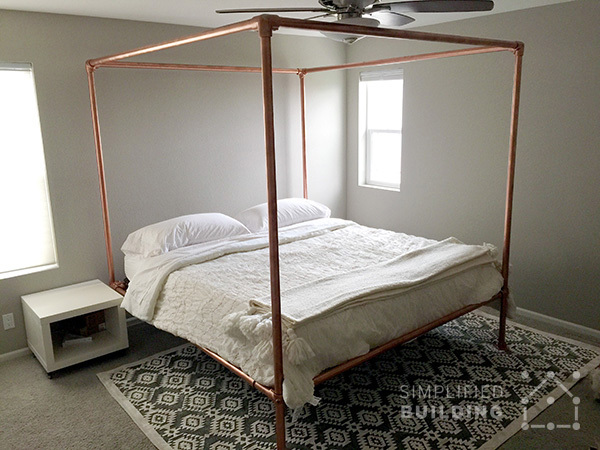 The fittings and pipe, used for the bed frame, were painted in a copper finish to complete the look. 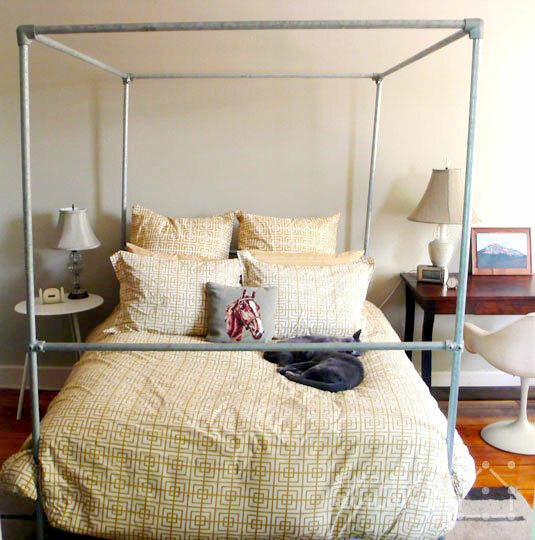 Julie from Austin, Texas built this canopy style bed frame for a king size mattress. The frame is approximately 8 ft. tall by 4 ft. wide. "I live in a small loft, but I'm a big guy. The bed had to be structurally sound and able to withstand a good nights sleep, and other activities as needed. This bed with the mattress weighs over 500 pounds. It does not move under any circumstance. Note the robe and towel hooks on each corner upright. When I depart this loft one day, it comes apart and goes with me. Thank you Simplified Building for great raw materials and your advice." 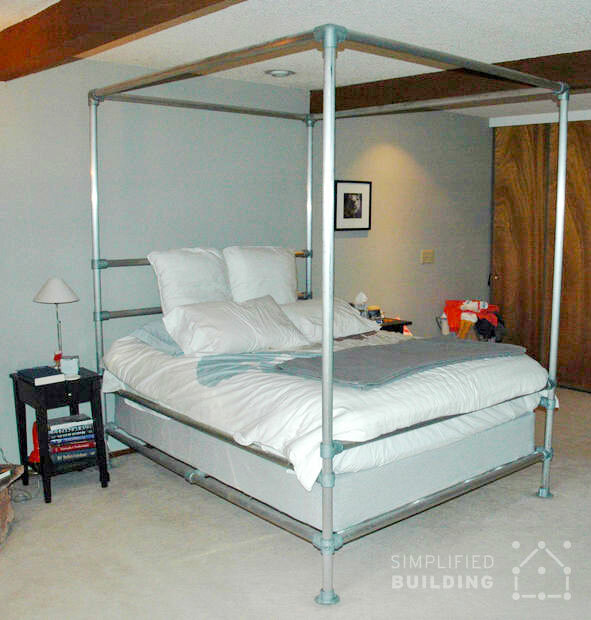 This canopy bed frame was built by Dennis as an alternative to a similar version he saw in a magazine ad for nearly $6,000. 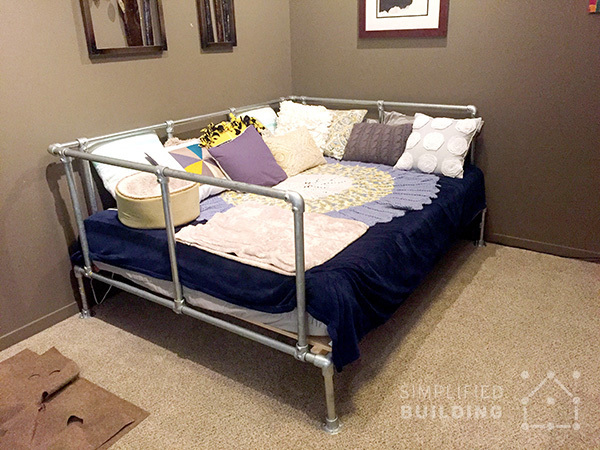 By building his own, using pipe fittings, Dennis was able to save a bunch of money and create an awesome bed frame in the process. 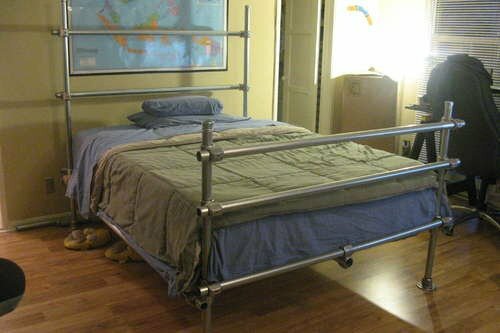 Instructions for building the bed frame can be found on Instructables here: "Aluminum Pipe Bed Frame Plans". 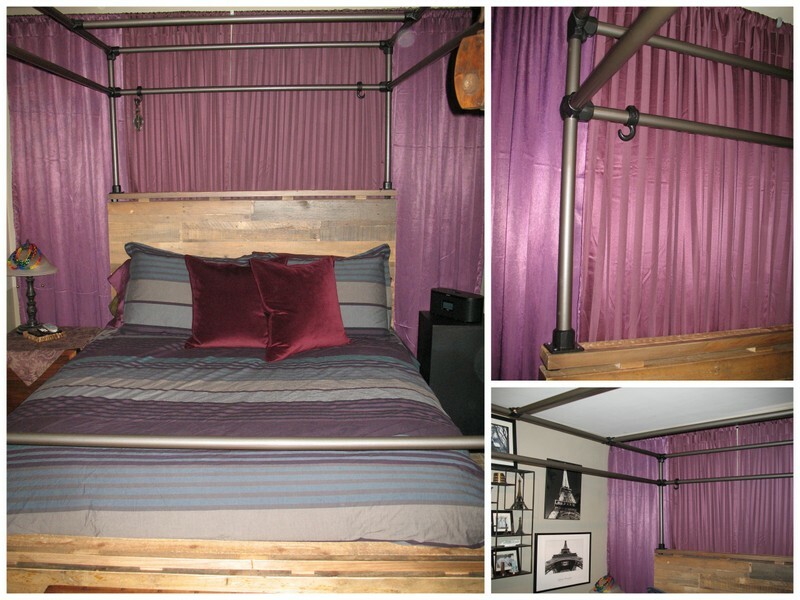 Built by Tracey from California, this canopy bed frame features reclaimed Peroba wood boards in the "headboard" and "footboard" sections of the frame. It also features Kee Klamp hooks, that slide directly onto the pipe frame, and allow for easy hanging of clothing. 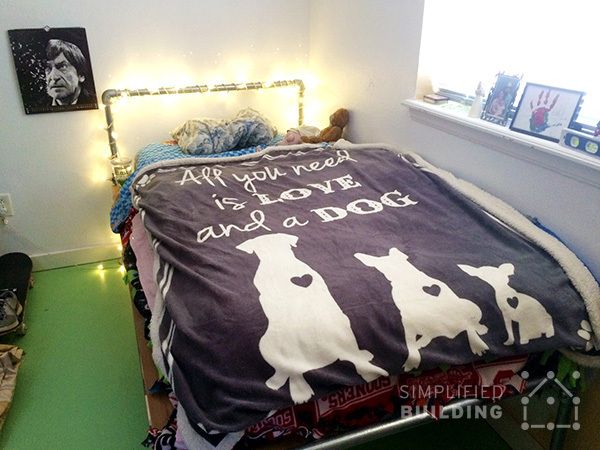 Read more about Tracey's bed frame here. This canopy bed frame features horizontal crossbars at the "headboard" and "footboard" sections of the frame for added support. They also allow the owners to hanging clothing or towels when needed. Read more about this design here. 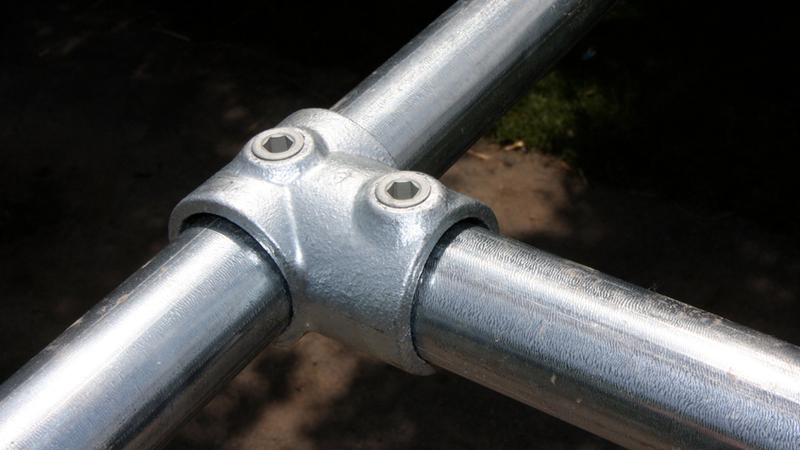 This frame makes use of the Three Socket Cross at the bottom intersecting corners of the frame, allowing one long length of pipe to slide through vertically. However, the Three Socket Tee could also be used here, to join two separate lengths of pipe, and accomplish the same look and function. 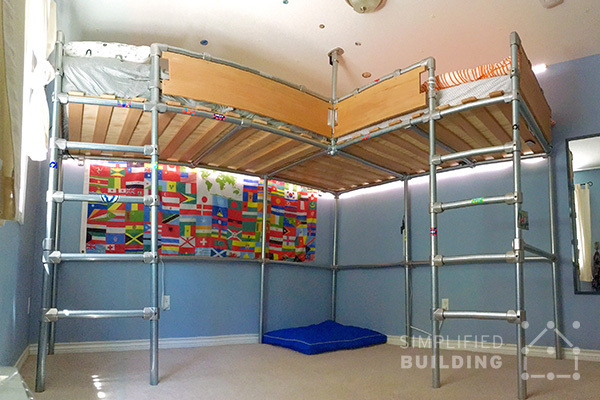 The above canopy bed utilizes Kee Lite aluminum fittings and aluminum pipe to create the bed frame. The aluminum pipe has a flatter finish compared to galvanized steel pipe. 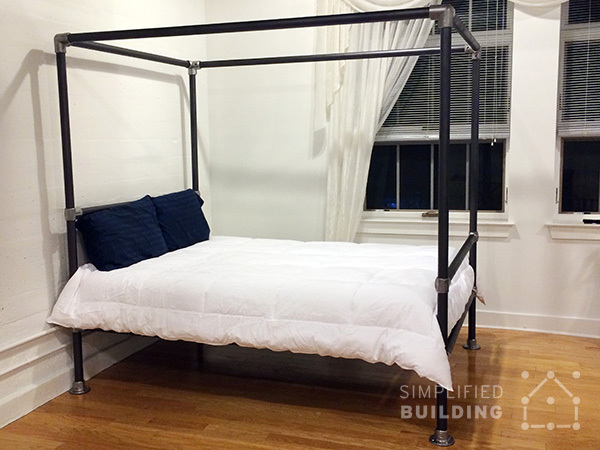 This minimalistic canopy bed frame sports a simple yet functional design. Since, the bed sits high off the ground, there is plenty of storage space under the bed. 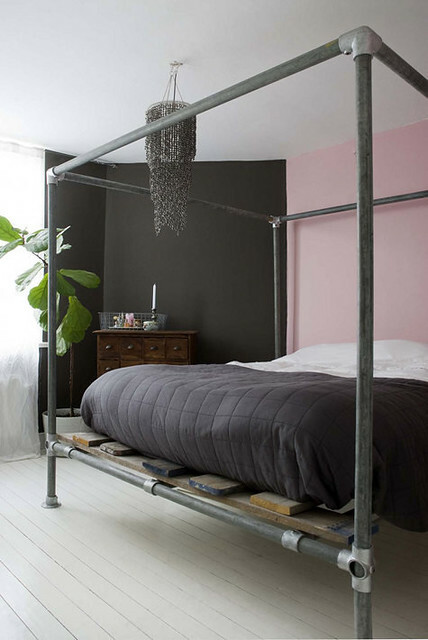 See more minimal designs in the following article: "15 Beds Made From Pipe to Give Your Apartment Industrial Chic". The above loft frame was built by David in Saratoga Springs, NY for his daughter's new bedroom. 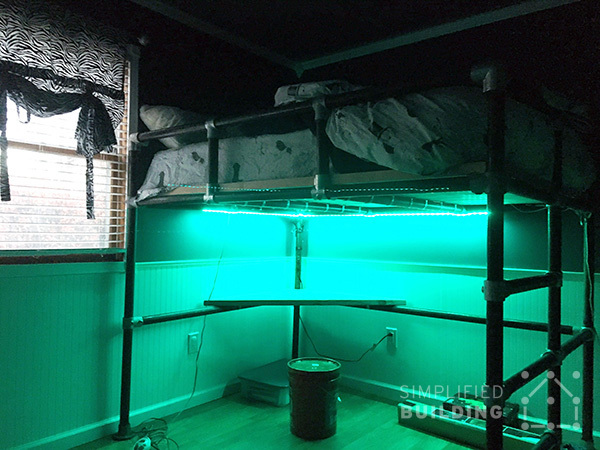 One of most unique features is the integrated lighting David added to the bed frame. David appreciated the ease of use and adjustability of using Kee Klamp for the frame. "I'm not a welder, and didn't want to incur the expense or take the time to cut threads into the pipe" said David. 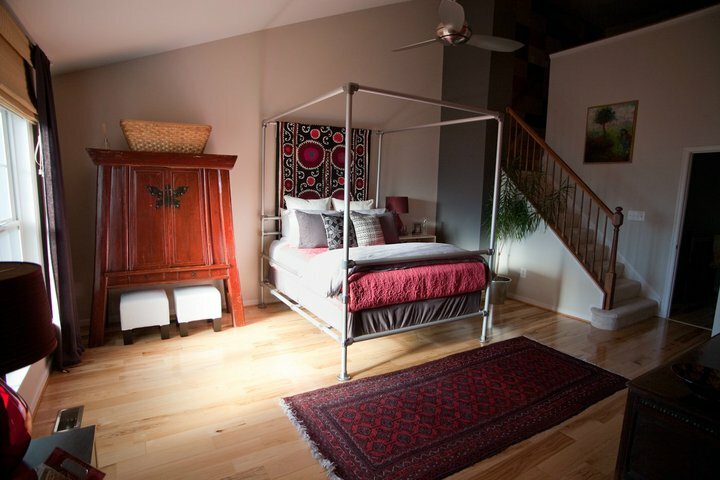 The above loft bed frame was built by Stacey in Wayne, Pennsylvania along with the help of her teenage son. The frame fits a full size mattress and features an integrated desk. The frame utilizes Kee Lite fittings and aluminum pipe to make the frame a bit lighter. 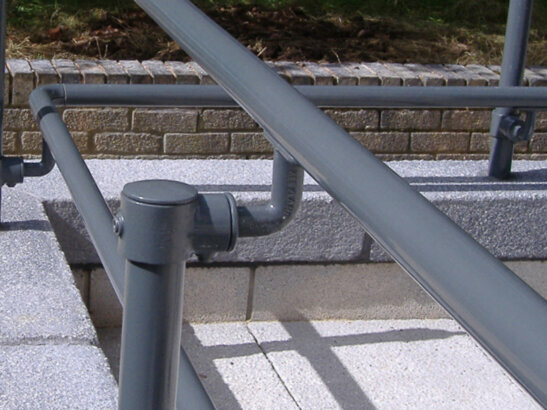 “It was by far the best solution, being able to just cut the pipe to length and easily assemble without worry of 'weak' joints. It was an easy decision." "It turned out awesome and I wanted to send a photo to you guys and thank you for your help with my order. My wife didn't understand why I was buying so many parts until she saw the finished product and she loves it! 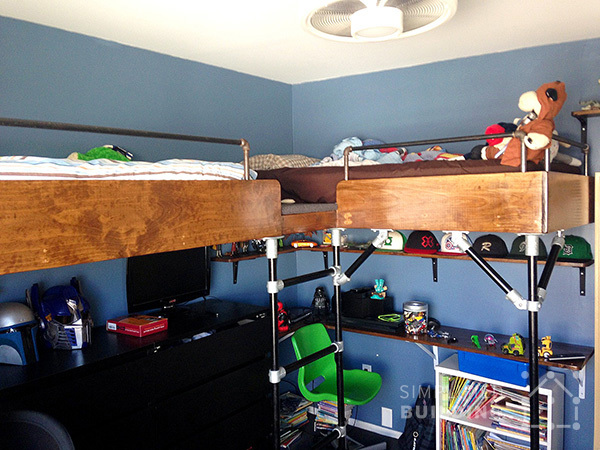 And of course my boys couldn't be happier"
The above loft bed frame was built to accommodate a twin size mattress and measures 84" tall, 75" long, and 38" wide. 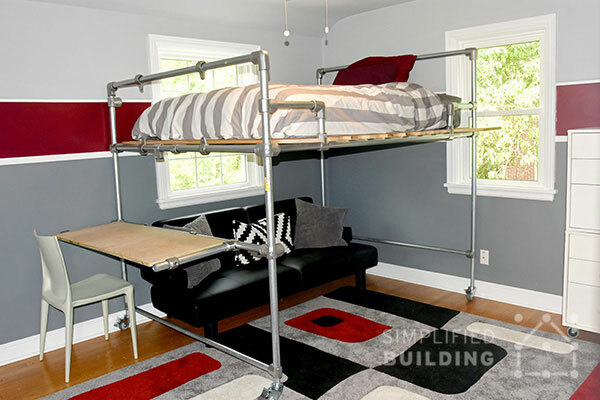 We show you how to build this exact bed frame, with detailed instructions and diagrams, in the following article: "How to Build a Loft Bed Frame"
The above loft bed frame features an integrated desk with room for storage underneath. The entire frame is built using Kee Klamp, while a wood plank placed across the bottom of the frame creates the desk table top. The ladder makes use of Flange fittings for the base and Single Socket Tee fittings for the ladder rungs. Each rung can be placed individually if desired, however, they are evenly spaced out in this design. The above daybed was built by Janna from Cedar Rapids, Iowa. Janna had a hard time finding a daybed that she liked, so she decided to build her own using Kee Klamp. She appreciated the idea of a sturdy metal frame and felt the industrial look of the pipe would complement here historic loft combo well. 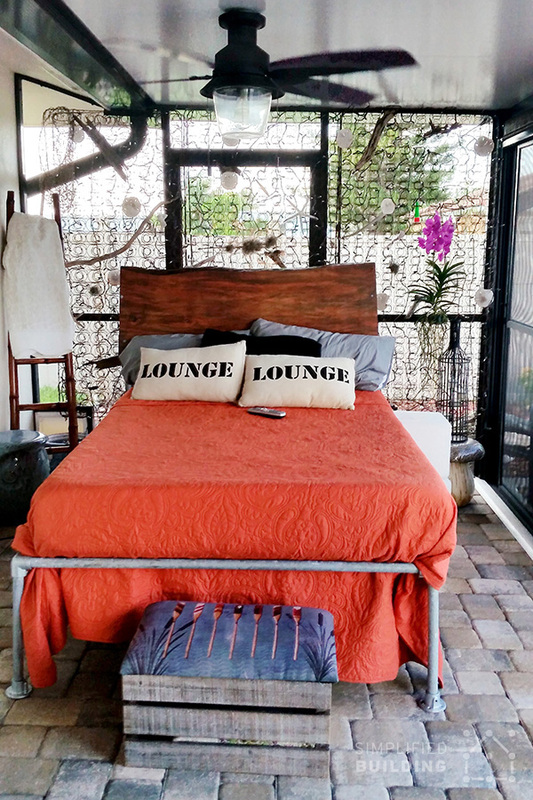 We can not agree more and think Janna's daybed looks fantastic! This daybed makes full advantage of a small space. It pairs well with the brick walls creating an industrial vintage feel. It makes use of the Single Socket Tee fitting to create the vertical supports at both ends of the bed frame. 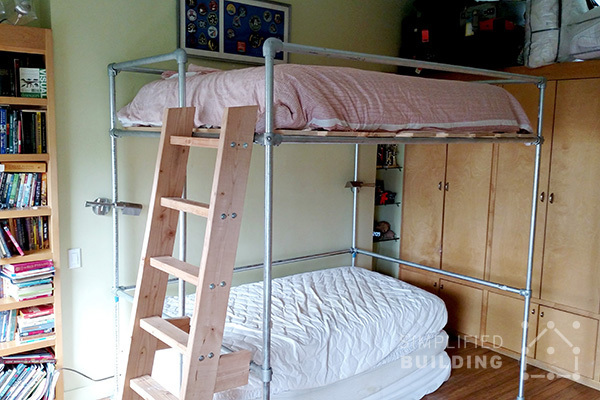 This loft/bunk bed frame was built by Justin from Brooklyn, NY. 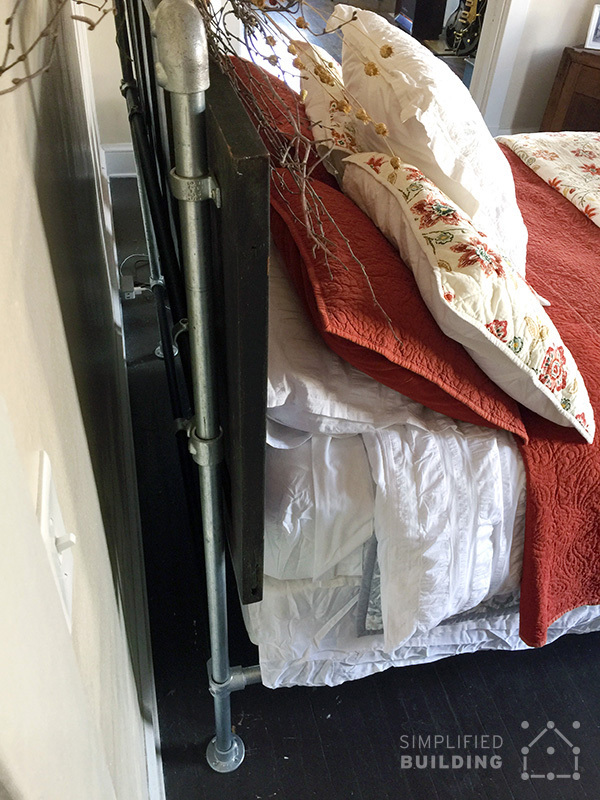 Justin appreciated the ease of use when using Kee Klamp but mostly appreciate the fact that he was able to create a unique bed frame rather than a store bought solution. 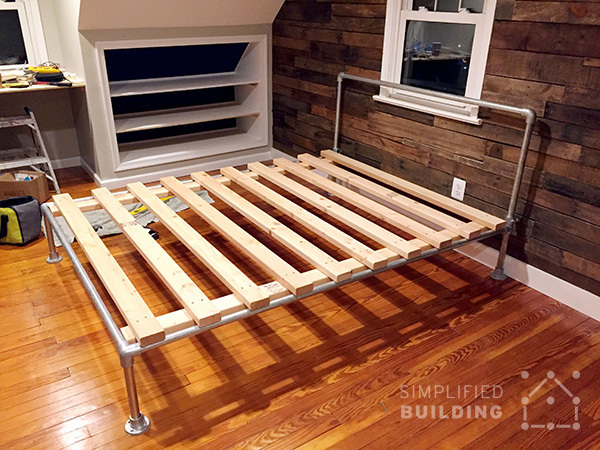 This bed frame is actually built primarily from wood but uses Kee Klamp fittings and pipe to create the bunk bed ladder. 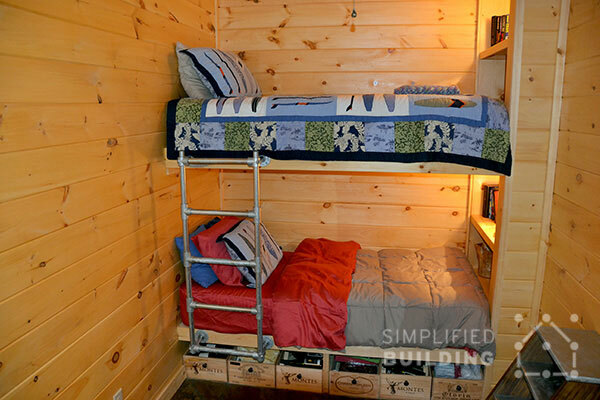 The bunk bed was built by Alex for his cabin in North Carolina. Alex appreciated the ease of use and wide selection of Kee Klamp fittings. He even built a table and corner shelf, before this project, using the fittings. 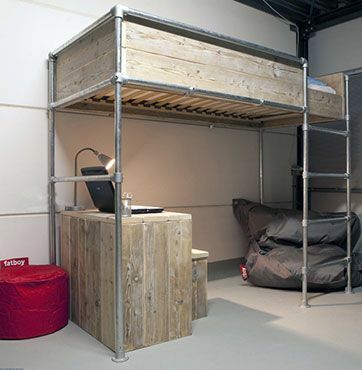 In the above design, the lower bunk rests on a cubee storage unit, while the top bunk frame is constructed from Kee Klamp fittings and pipe, which is then mounted to the ground and wall. To do this, the frame utilizes the Flange fitting to mount the frame to the wall and give the legs a solid footing. 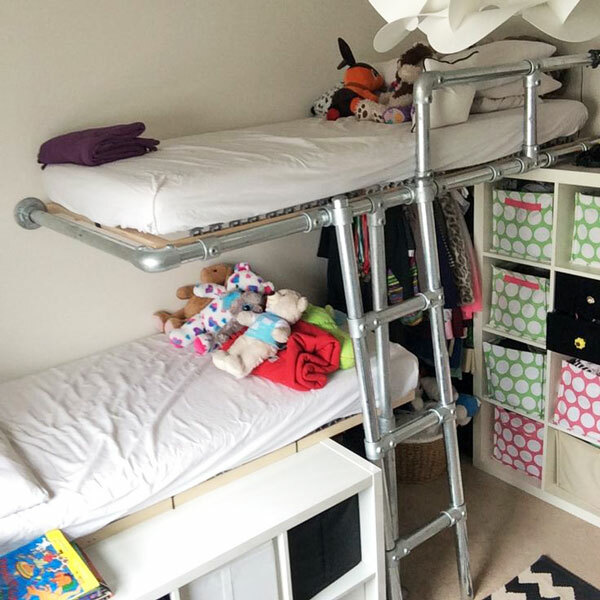 This "bunk bed" features a non-traditional design that places the two bed perpendicular to each other. Both utilize Kee Klamp fittings and pipe to create the bed frame. 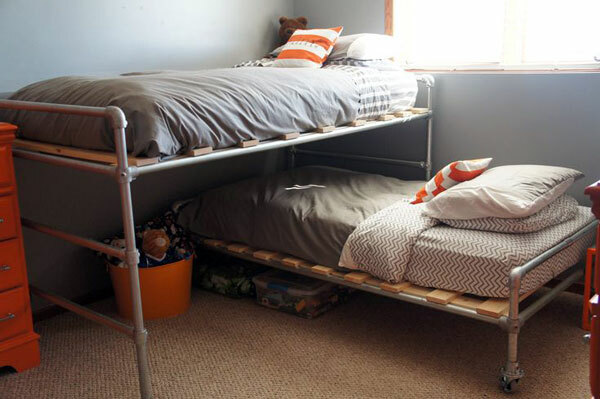 The bottom bunk features casters on the frame legs to make it easy to move when needed. The above bed was built by Raymond for his two boy's bedroom. The bed mimics a flying saucer and makes use of the Swivel Flange fittings to create the individual rungs that run along the middle of the bed. The bed is attached to both the wall and the ceiling. 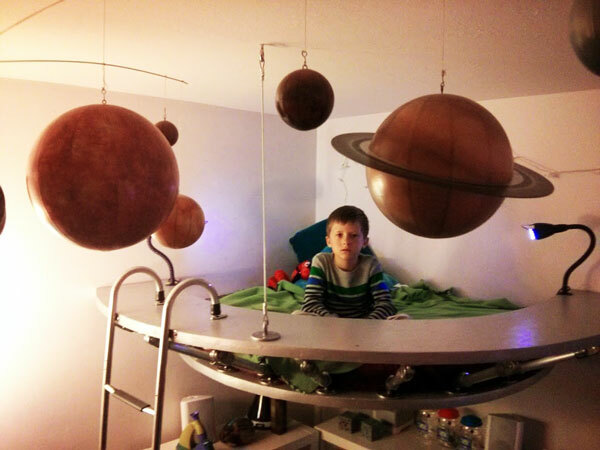 This lunar rover bed was also built by Raymond and completes the outer space theme in his two boy's bedroom. The car body was built using wood while fittings and pipe were used to create the "roof" frame. 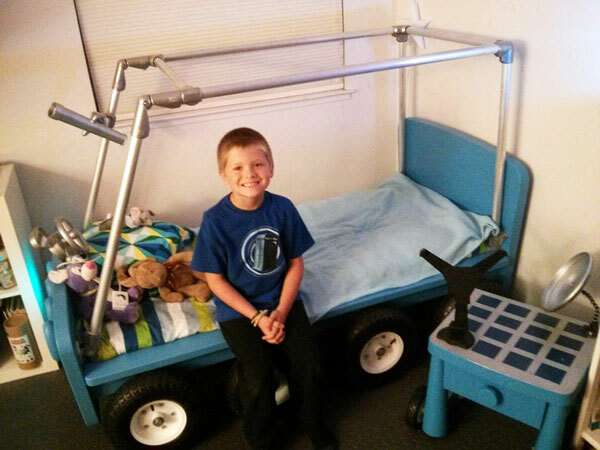 Read more about the two beds in the following article: "10 Unique Kids Beds You Can Build Yourself". 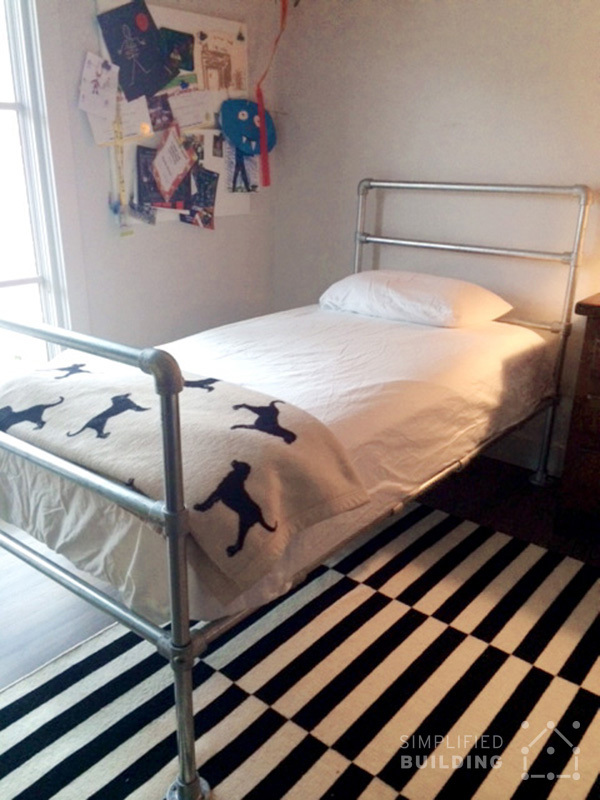 These two kids bed frames feature integrated casters for easy moving when necessary. 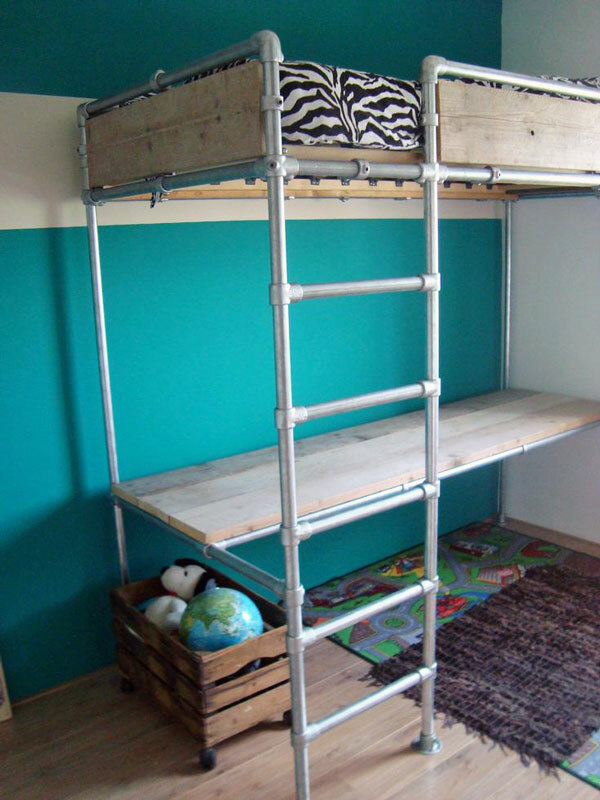 See more bed frame ideas for children in the following article: "10 Unique Kid Beds That You Can Build Yourself". Hopefully, after scanning this massive list of DIY bed frame ideas, you were able to find one that suits you. If not, no worries, try browsing our Pinterest board for more inspiration. Also, remember we're here to help. If you have any questions, need help with coming up with the perfect design, or can;t figure out which fittings to get, don't hesitate to reach out to our projects team for assistance. They can be reached at via email (projects@simplifiedbuilding.com) or you can visit our free design assistance page. Finally, for a simpler solution, we do offer a bed frame kit. Take a look and see if it works for your application. Did you enjoy this article? Let us know in the comments below what you thought of ideas in this post and be sure to sign up to our email newsletter to receive updates on future projects like this one.